Hallux valgus: Conservative treatment or surgery? What is Hallux valgus? Hallux valgusis the most common deformity of the forefoot and the toes. 23% of 18-65 year olds and over 35% of those over 65 years have hallux valgus. Due to the noticeable form it’s also referred to as a bunion or ganglion. Here the big toe moves out of its alignment and points toward the outside edge of the foot. With hallux valgus, the often painful and inflamed, swollen metatarsal head in the metatarsophalangeal joint commonly bulges, pushing against the shoe. In a hallux valgus deformity the big toe - almost always in conjunction with splayfoot - first deviates toward the outside edge of the foot. So with hallux valgus, the tendon in the big toe no longer runs parallel to the big toe and straight in the metatarsophalangeal joint: Instead, a deviation from the normal alignment of the big toe develops. This causes a growing and usually painful, inflamed protrusion in the metatarsophalangeal joint: This is the protruding ball of the toe which always accompanies hallux valgus. Skewed toe, bunion. The big toe is bent, pointing toward the outside edge of the foot. Exostosis is a protrusion of the metatarsophalangeal joint which causes it to push against the inner edge of the shoe. Splayfoot is a drop in the front arch of the foot (transverse arch). Hallux valgus always develops due to splayfoot. Metatarsalgia is metatarsal pain. With hallux valgus, metatarsalgia develops due to shifting the weight from the big toe to the now overstressed small toes while walking. The bursa protect bones and tendons from pressure and friction. The bursa enlarges due to the exostosis in the ball of the toe. It can swell and become painfully inflamed (bursitis). Is hallux valgus a cosmetic or medical problem? Hallux valgus is not always painful. Many of those afflicted - at least early on - consider this a cosmetic problem which becomes noticeable when wearing open toed footwear. Hallux valgus does not need to impact everyday life. Fig. 3: Beautiful feet are the goal of all hallux valgus treatment. No stitches in the visible area of the toe or the foot. Due to the general medical risk and the post-operative limitations in everyday life we are unable to perform hallux valgus straightening for purely cosmetic reasons. The desire for a good cosmetic result, however, is natural and is a high priority among surgical goals for hallux valgus. The most cosmetically optimal surgery is also always the method easiest on the patient: Skin incisions, scarring and the use of implants are minimised. The progressive (intensifying) course of hallux valgus with continuously increasing deformity, however, makes conservative or surgical straightening of the big toe advisable even without severe pain. The later the position of the big toe is corrected, the more severe the complications we see in the big toe joint and the forefoot of (usually female) patients. Don’t wear high heeled shoes every day. Walk barefootas often as you can. Do foot exercises and strengthen the muscles in the foot. Reddening and an enlarged ball forming at the metatarsophalangeal joint. Active flexibility in the big toe is limited to the extent of stiffening. The big toe deviates to the side. The big toe is rotated on its axis, i.e. turned. Reddening and calluses forming under the ball of the toe / metatarsus of the 2nd-4th toe. How does hallux valgus develop? Hallux valgus always develops as a result of splayfoot. With splayfoot, the front arch of the foot (transverse arch) drops. The ends of the toes rest flat on the ground. The toes have a skewed outward position. With hallux valgus, strain on the tendon causes the big toe to rotate out of the metatarsophalangeal joint - just like a bow curved by the bowstring - inwards, toward the other toes. The adjacent toes are crowded out by the big toe which is rotated inwards, and subsequently also become deformed as a result of hallux valgus: Hallux valgus therefore often occurs in connection with hammer and claw toes. 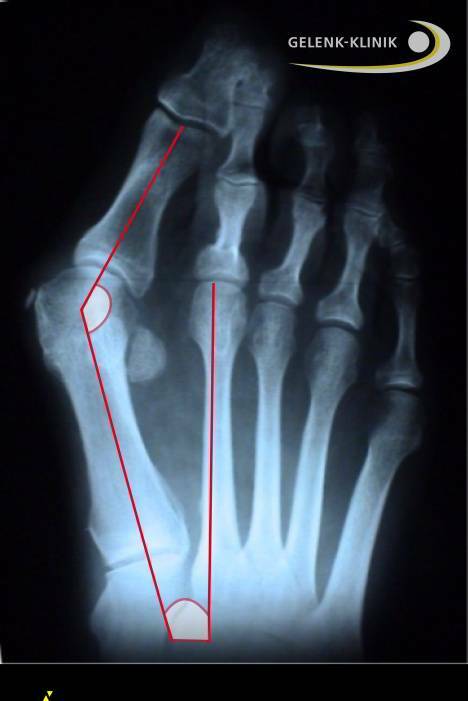 The deformity causes signs of wear in the metatarsophalangeal joint: The misalignment of the big toe can result in arthritis and painful stiffening of the metatarsophalangeal joint (hallux rigidus). Hallux valgus is often accompanied by painful bursitis and arthritis. The ball at the inside of the foot protruding greatly at the metatarsophalangeal joint in hallux valgus is the bunion. 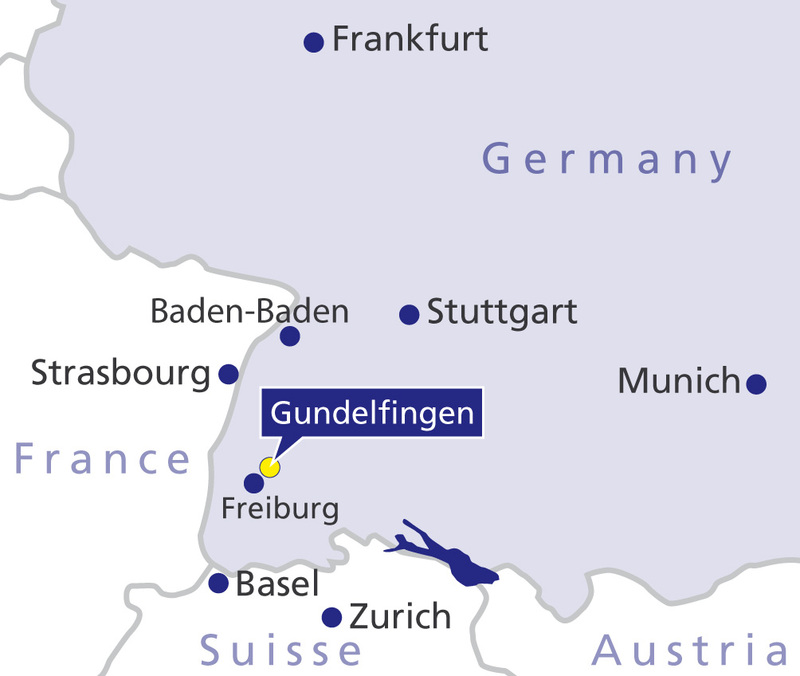 The illustration here (Fig. 5) shows the angle between the position of the big toe and the toe flexor tendon. The deformity in the sesamoid bones is also quite noticeable. These tiny bones are freely suspended by several tendons and form the trochlea for these tendons. The sesamoid bones, located below the metatarsophalangeal joint typically hold the foot ray between them. In cases of hallux valgus these sesamoid bones are shifted to the side. The more the sesamoid bones have shifted, the more pronounced the hallux valgus deformity will be. If these sesamoid bones no longer function as a trochlea for the tendons in the big toe, the normal roll-off process through the big toe whilst walking is lost. More and more of the load is absorbed by the smaller toes. This shift in weight away from the big toe as a result of hallux valgus can cause metatarsal pain, a so-called transfer metatarsalgia. About 90% of all patients with hallux valgus report a family history. And yet the cause is not merely congenital since nobody is born with bunions. So there are always environmental and lifestyle factors which allow hallux valgus to develop. Cultures which do not wear shoes experience virtually no hallux valgus. One common cause for hallux valgus or bunions is a congenital weakness of the connective tissue. This then also affects the tendons stabilising the longitudinal and transverse arch of the foot. What is called splayfoot develops. In splayfoot the front transverse arch of the foot has dropped. The toes lose their natural forward direction. Splayfoot is therefore the most common initial finding in hallux valgus. Foot deformities developing after accidental and other foot injuries, e.g. fractures, can also encourage hallux valgus. Even inflammatory changes in the joints (arthritis) can be a cause for hallux valgus. Acquired deformity, e.g. from high heeled shoes. Congenital predisposition (common in some families). 3. Women are affected more often due to the weaker connective tissue. Splayfoot or skewed foot encourage hallux valgus. An accident can be the cause for hallux valgus. Arthritic changes to the joints can be the cause for hallux valgus. Some neurological disorders can lead to hallux valgus. Wearing shoes which are too tight with high heels for years commonly encourages hallux valgus to develop. If a large part of the body weight no longer rests on the heel and the longitudinal arch of the foot, but instead presses on the delicate forefoot, the front transverse arch of the foot loses stability: Splayfoot develops. This is why hallux valgus primarily affects women. With hallux valgus the big toe is constantly pushed toward the other toes. The attached muscles therefore develop an altered tension direction and pull the toe even further outward. High heels and the resulting additional weight which continues to spread it apart more and more encourages hallux valgus forming. Other stress-related factors contribute to hallux valgus developing: Being overweight and long periods standing can destabilise the tendons in the forefoot, allowing the transverse arch of the foot to drop. Hallux valgus primarily affects women (90% of hallux valgus sufferers are women). The rate of hallux valgus increases noticeably with age. However, some very young women and also men have hallux valgus: Then the cause for hallux valgus is not determined by overloading the feet but by genetics. Hallux valgus is rarely seen in countries where people are barefoot or wear comfortable, open shoes or sandals. In Japan and China, where it is considered fashionable to wear small, narrow shoes on the other hand, hallux valgus is very common. Which problems and symptoms do patients with hallux valgus experience? Whilst hallux valgus is a common foot deformity, it does not cause severe problems in all patients. The deformity of the toes seen in hallux valgus often bothers female patients: They consider it a cosmetic problem. In this case problems related to hallux valgus usually occur above the metatarsophalangeal joint. The metatarsophalangeal joint which commonly protrudes greatly in hallux valgus rubs against the inside of the shoe, causing inflammation. The ball of the toe becomes red and swollen in hallux valgus. Pain from excess stress on the metatarsus. With hallux valgus, the swelling of the bursa and soft tissues (bursitis) at the metatarsophalangeal joint will continue to increase. As swelling increases, so does the extent to which the ball of the foot rubs against the inside of the shoe. In response to this friction the bursa of the metatarsophalangeal joint thickens further. The job of the bursa is to protect bones and joints from pressure and friction. A real vicious cycle. The bursa can become inflamed. Whether a bacterial or a non-bacterial infection, bursitis is one of the most painful afflictions of all. Bursitis of the foot, constantly rubbing against the shoe in the weight-bearing area of the metatarsophalangeal joint, is one of the most uncomfortable pains. Another source of pain in hallux valgus is the continuously growing arthritis of the metatarsophalangeal joint due to the deformity in the joint. The cartilage in the big toe joint continues to thin due to friction. At a certain point inflamed arthritis of the big toe may occur, which is particularly painful. Shifting weight away from the big toe and to the four smaller toes results in overstraining them. This can cause metatarsal pain in response to the weight shift (so-called transfer metatarsalgia). Hallux valgus pain initially only occurs with specific stress, when specifically exerting pressure onto the joint. In more advanced stages the hallux pain can occur as an agonizing resting pain regardless of stress. Reddening and swelling of the ball of the toe. Deformity of adjacent small toes under the pressure of hallux valgus (e.g. hammer toes). Pain along with swelling and reddening can also occur on the inside edge of the foot above the first metatarsal bone. Hallux valgus patients therefore prefer to buy shoes one or two sizes larger to prevent painful friction on the ball of the toe. The pain and symptoms in hallux valgus do not necessarily depend on the degree of deformity. Severe hallux valgus deformities are often still painless whilst some patients trigger severe foot pain with even minor deformities. How does a specialist diagnose hallux valgus? Hallux valgus is typically even obvious to laymen. The orthopaedist usually recognises hallux valgus deformity upon looking at the foot. Hallux valgus is often accompanied by a visibly enlarged angle in the metatarsophalangeal joint. The hallux valgus patient’s description of problems confirms the physician’s suspicion. In addition, hallux valgus patients usually experience accompanying deformities of the foot. Splayfoot with a visible decline in the front transverse arch of the foot, sunken metatarsal heads, is a cause of hallux valgus. Hallux valgus is also accompanied by other defects of the arch of the foot. The first thing to identify is the skewed foot: A defect in the longitudinal arch of the foot. Here the physician will identify an X-position of the heel, with the sole of the foot resting flat on the floor a characteristic, sunken longitudinal arch. Hallux valgus patients often complain of load-dependent foot pain with long periods standing or walking. Hallux valgus is often passed down through families. The orthopaedist therefore inquires about family members with hallux valgus. An x-ray of the foot provides additional certainty in diagnosing hallux valgus. It shows the exact extent of the hallux valgus deformity. In the process, the exact geometric deviation between the hallux valgus deformity and the normal position is measured whilst standing - so bearing weight - the so-called hallux valgus angle. 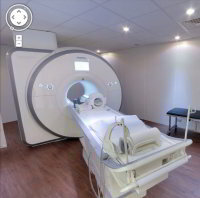 Magnetic resonance imaging (MRI) will detect cartilage damage, trapped soft tissue and bone damage. 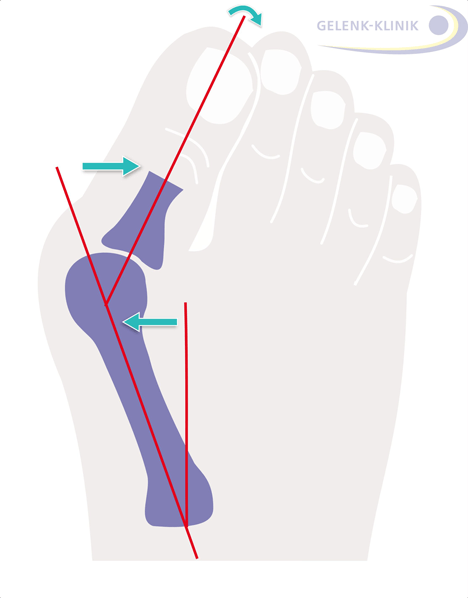 A big toe position with an angle of up to 10° is still considered normal. A minor hallux valgus defect is 16-20°. A moderate hallux valgus deformity has a deviation of 16-40°. A severe hallux valgus deformity has a deviation of over 40°. Position of the big toe deviating outward more than 10°. Commonly, the big toe is rotated by its axis. The first metatarsal bone protruding at the inside edge of the foot. Callused protrusion at the inside metatarsophalangeal joints. In some cases inflamed, red swelling of the skin and bursa. Flattening of the transverse arch of the foot and spread forefoot. Decreased flexibility or fixation of the deformity. Deformity in adjacent toes is observed. Hallux valgus toe rotated around the longitudinal axis. Callus patterns typical to hallux valgus. How severe is the hallux valgus rotation? Is it possible to move the big toe to its normal position from the hallux valgus deformity? How stable is the attachment of the first metatarsal bone at the tarsus? 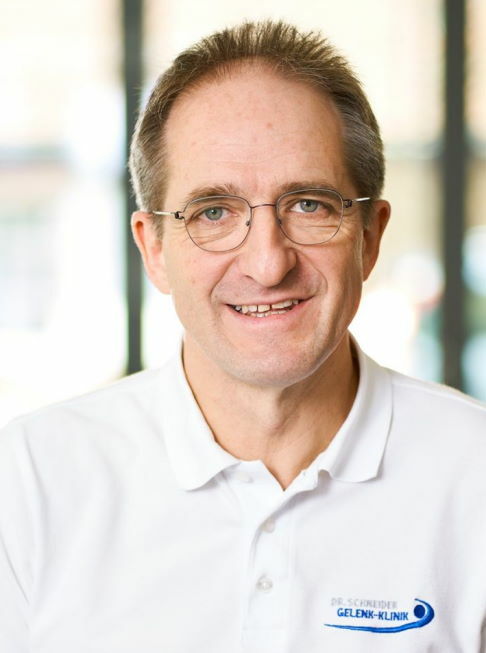 -Here an instability can be an important factor for examining inadequate corrections in line with prior hallux valgus surgeries. Hallux valgus often originates from this instability. Are bone spurs (osteophytes) already present in the big toe joint as a sign of arthritis in the joint? Are wear-related secondary diseases already present? Can the sesamoid bones be moved? Can arthritis of the small metatarsal bones be identified under the first foot ray? The prognosis of hallux valgus varies depending on the stage and patient group. In young patients with a flexible, and so still actively restorable deformity of the big toe, the prospects of being able to raise the arch and correct the hallux valgus position through physical therapy foot exercises and conservative treatment are good. In older patients with an already contract - i.e. no longer actively restorable - deformity of the hallux valgus, hallux valgus surgery offers good prospects of painlessness and permanent normalisation of the toe deformity. The results of surgical hallux valgus correction are very good with the appropriate procedure. The bunion - the swelling of the metatarsophalangeal joints at the inside of the food characteristic of hallux valgus - continues to increase due to strain from the tendon on the inward rotated big toe. As the deviation of the big toe increases outwards, the pull of the tendons and muscles continues to worsen the hallux valgus deformity. At the onset of the deformity the hallux valgus is still flexible and passively compensable. But as hallux valgus progresses the big toe becomes permanently stiff and crooked. Each step at the end of roll-off creates maximum pull on the tendon, which then intensifies the hallux valgus deformity further. The unnatural shape of the metatarsophalangeal joint and the forefoot in hallux valgus impairs the normal function of the foot. The bunion is not just a static deformity. This deformity also affects roll-off, weight distribution, and gait coordination. 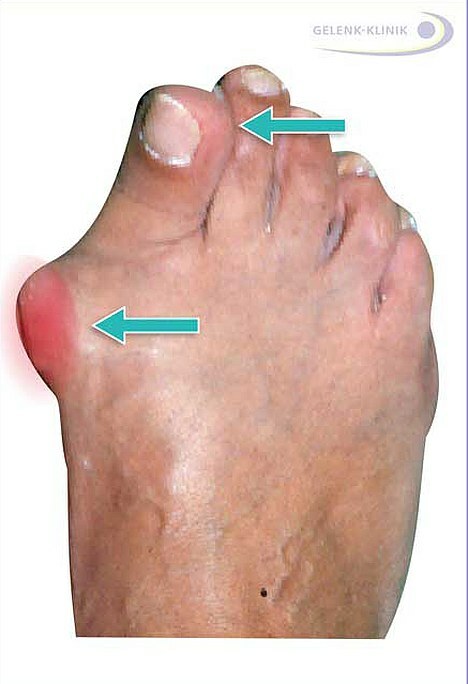 Undetected and left untreated, hallux valgus causes permanent irritation of the skin, the bursa and the joint capsule. Irritation, swelling, non-bacterial and bacterial bursitis and thinning of the capsule can ensue due to hallux valgus and result in problems increasing further. Severe hallux valgus deformity with hammer toes, front view: Hallux valgus can also crowd out the adjacent toes. The callus under the small toes as a result of the redistribution - away from the big toe and onto small toes - is clearly visible. The hallux valgus deformity can also result in adjacent toes being crowded out, overlapping, or deforming. Resulting in the typical hammer- and claw toes. 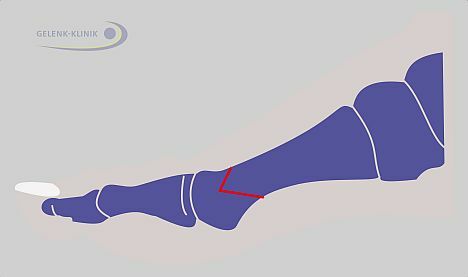 If the first foot ray of the big toe deviates outwards, the load on the other metatarsal bones also changes: They are strained more during roll-off although the big toe is actually designed to bear the majority of the weight. This shift in weight can result in metatarsal pain: This is referred to as transfer metatarsalgia as a result of hallux valgus. The 2nd Metatarsal bone in particular can be affected by hallux valgus. The direct result of hallux valgus then is a claw toe in the toe next to the big toe (see image) with severe overstraining and pain syndrome of the metatarsus (so-called metatarsalgia). Many patients then believe hallux valgus is actually symptom-free and only the metatarsus is painful. But the cause of this hallux valgus related metatarsalgia is always the deformity of the big toe: That’s what needs to be treated. Therapy: How can hallux valgus be treated? Reduction of Hallux valgus related pain. Slowdown or correction of hallux deformity. Recovery of function of the big toe and the big toe joint (MTP-joint). There are numerous bunion treamtments. What treatment is appropriate for each patient, the orthopedic surgeon will decide taking into account - among all other circumstances the degree of hallux valgus deformity, the existing co-morbidities and the patient's personal situation. The best treatment is, of course, prevention. Through exercises that promote the free movement of the big toe in all directions, the emergence of hallux valgus can be effectively prevented. But very few conduct such preventive exercises from the adolescence on. If the bunion only occurred once, conservative therapies may only alleviate the symptoms: A provision of hallux valgus is then no longer possible. Which treatments help in the early stages of hallux valgus? The hallux valgus splint can straighten the skewed toe. © Bauerfeind If hallux valgus is detected in the early stages, the orthopaedist can treat the deformity with conservative therapy. First and foremost, wearing flat shoes with ample room for the toes every day. For mild hallux valgus, treatment includes hallux valgus insoles, to support the front arch and to prevent splayfoot from progressing. There are also hallux valgus splints, which reduce pressure from the big toe to the adjacent toes. Hallux valgus shoes have flat heels. They are amply wide at the forefoot and allow the toes plenty of flexibility. Hallux valgus exercises and walking barefoot can further improve further development in early stages of hallux valgus deformity. Activating and relaxing the foot and toe muscles naturally strengthens and straightens the front arch of the foot. The natural shape of the foot is not a purely static skeletal function: Well trained, active muscles from early adolescence are required to provide the shape and stability for a flexible arch. And only intact arches can prevent the hallux valgus condition from progressing. Consistent skin care of the pressure spots is very important in treating hallux valgus. Swelling and consequently friction inside the shoe directly contribute to hallux valgus being painful. Detumescing skin care measures are therefore key for conservative treatment of hallux valgus pain. Special Hallux valgus shoes, providing more room for the bunion can minimise friction and therefore reduce swelling, inflammation and hallux valgus pain. 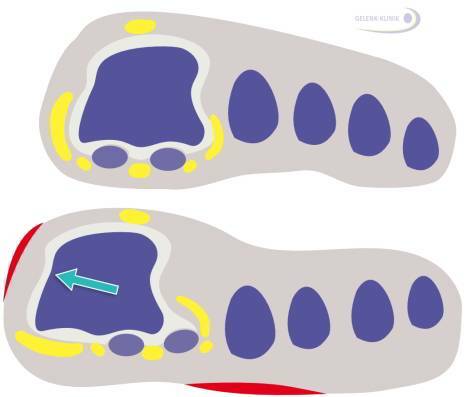 Insoles can support the splayfoot: The forefoot narrows again by raising the front arch. This minimises irritation to the bunion from friction inside the shoe: Swelling from hallux valgus can be reduced. Indications for surgery: Which treatment helps for advanced hallux valgus? When does hallux valgus require surgery? Big toe pointing toward the small toes. Conservative treatment and hallux valgus splints no longer provide improvement. With advanced hallux valgus where every step hurts, the patient’s pain can only be relieved long term with hallux valgus surgery In adult patients we can only slow the progression of the disease with physical therapy exercises and a splint. In this case, surgical straightening of the bunions is the only causal option for treating hallux valgus pain and preventing complications in the metatarsophalangeal joint. Exactly how far does the hallux valgus actually deviate from normal anatomy? Which of the surgical methods is suitable to restore a largely normal anatomy of the big toe? Can restoring the normal condition even be expected after hallux valgus? How advanced is the arthritis in the metatarsophalangeal joint? A soft tissue procedure corrects the tendons and joint capsule to allow the big toe to be straightened. A procedure on the bone in the big toe - usually repositioning (osteotomy) - will usually straighten the toes forward again. Patients want to have anatomically normal, straight and cosmetically appealing feet after surgery, which are able to withstand the strain of sport and daily living. The important correction aims at preventing wear (arthritis) in the metatarsophalangeal joint and problems in the forefoot (such as hammer toes and metatarsal pain). The goal is to permanently normalise the gait and the mechanics of roll-off whilst walking. The important metatarsophalangeal joint can suffer arthritis (joint wear) due to the hallux valgus deformity. This joint wear can either be treated by preserving the joint (arthroscopy) or fusing the joint (arthrodesis). There is also the option of full or partial prosthesis (Hemi prosthesis) of the metatarsophalangeal joints. There are now many different hallux valgus surgery techniques. Before looking more closely at the important procedures in a different article on → hallux surgery, we would like to quickly single out the principles of correcting hallux valgus they all have in common. All specific procedures on the metatarsophalangeal joint include these treatment options. The capsule around the metatarsophalangeal joint has narrowed due to the deformity so the deformity is contrakt, i.e. can no longer be actively returned. So the release and expansion of the joint capsule and adjusting the length of the tendons controlling the big toe is an important step in achieving permanent straightening of the big toe. The joint capsule changes due to hallux valgus. On the side of the bend in the metatarsophalangeal joint (red in the adjacent drawing) the capsule is overstretched, on the other side it is contracted. This change to the joint capsule must be corrected through condensation and expansion. The affected tendons (yellow) also require length correction. With surgical osteotomy the metatarsus and phalanges are severed and joined again in a new, desired direction, and stabilised with screws, wire or small metal splints until healed into place in the new position. If the joint is still more than 50% cartilage, a joint-preserving, minimally invasive arthroscopy of the metatarsophalangeal joint can be performed. Any bone spurs which are present are removed. The prospects of cheilectomy must sometimes be determined during surgery, after having a direct view of the joint. If the damage is already too severe, this procedure cannot provide any relief for problems. In patients with severe hallux valgus deformity and arthritis of the metatarsophalangeal joint sometimes the big toe must be removed entirely and fixed. This fixation is done by fusing the joint partners. If necessary, this fusion (especially in women) has an angle which also allows for wearing higher heels without restricting motion. Medical advancements have developed many different hallux valgus surgical methods. The most promising hallux valgus surgical technique was developed in recent years. 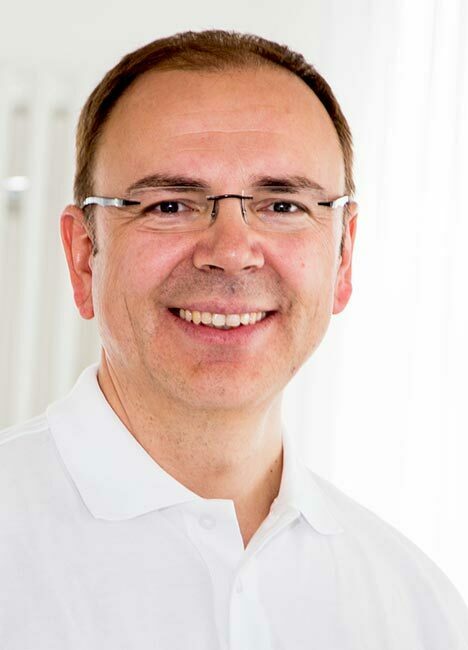 It is internationally proven but so far only performed by a small number of Germany clinics: The so-called minimally invasive hallux valgus surgery. By using tiny instruments only 2mm large, similar to dental instruments, injury to the soft tissue during the hallux surgery, and hence the healing time, can be considerably reduced. Special characteristics: With this hallux valgus surgery, no screws are installed for minor deformities. This eliminates the need for follow-up surgery to remove the screws. By using the smallest tools - similar to dental instruments, the corrective osteotomy required for hallux valgus can be performed with minimal injury to the skin and soft tissue. This reduces the healing time and rate of complications, and wound repair is accelerated due to the minor injury to the soft tissue.